Rick Hatton is nothing if not ambitious! 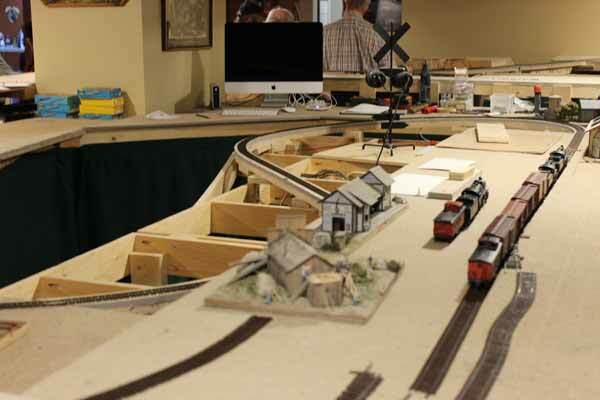 He is building this large, freelanced HO model train layout by himself. He finally started construction of the benchwork in 2017 and now has the mainline operational. Track is code 83. Turnouts are hand built, many using Fast Tracks jigs while others were built in place. This is still a "homasote railroad". No scenery has been done and turnouts are cut in on the mainline but only a few sidings and passing tracks have been started. He is using Digitrax. 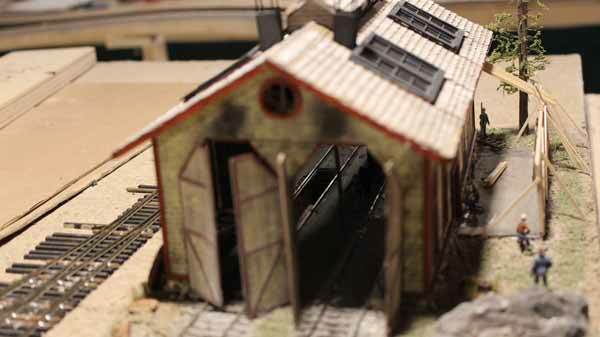 In January, 2018 he invited friends and fellow modellers to have a first look at what he has been up to. Some other members of our Nottawasaga Club were there when I dropped by along with a number of guys I know from operating sessions on Al Crisp's northern Ontario HO layout, as well as Al himself. Rick is well-known in the area because he is the Canadian President of the Niagara Frontier Region (NFR) of the National Model Railroad Association (NMRA). 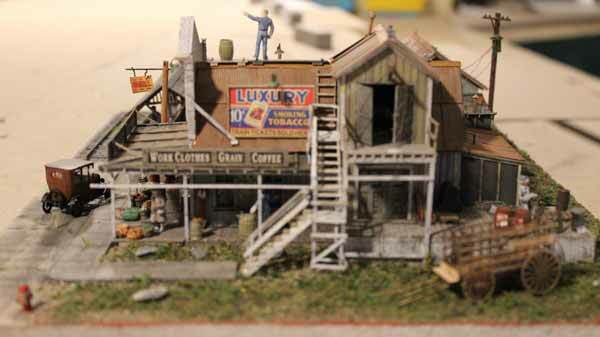 He is also active at the NFR's Craftsman Corner at regional model train shows. Rick is a terrific modeller and makes sone wonderful buildings. 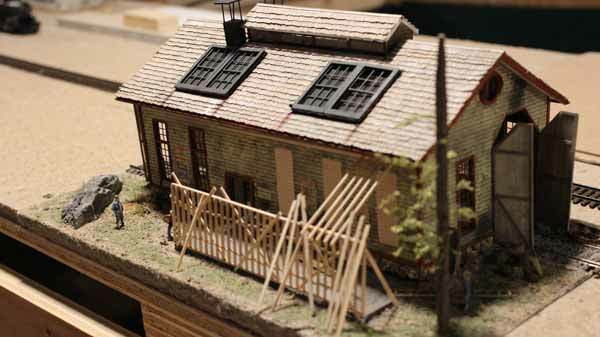 Currently he is working on a model of the famous Watt's boathouse in Collingwood harbour complete with a fully detailed interior. I don't know how he is finding time to tackle such a big HO model train layout as well. I guess he doesn't sleep! Here's a quick look at a train on the mainline and some of the superb buildings waiting to be "planted". 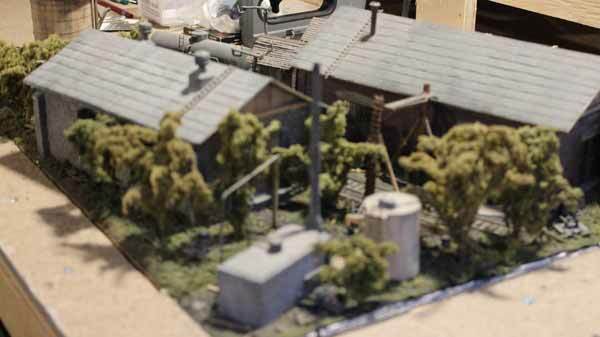 Rick has a number of detailed scenes he constructed at his workbench before starting on the actual layout. This way the scenes can be inserted where he wants and are self-contained should they ever need to be moved. It is a good habit to follow. I totally destroyed one of my favourite Campbell kit scenes trying to remove it from my old layout. Rick's approach makes much more sense. 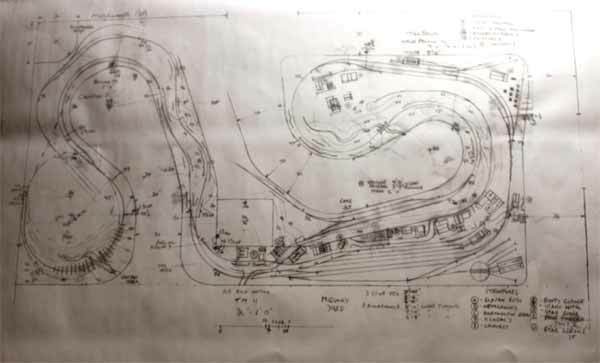 I'll update this page later in 2018 after Rick has had a chance to move the project along.